Q: Jim, I have a John Deere model 425 garden tractor that has about 800 hours on it. I use it for mowing only. When I start it up it smokes a little and it will only stay running when the choke is half way up. Can you help me? A: I would start with the basics and replace the spark plugs, but I think you should clean out and overhaul the carburetor. Don’t worry about the smoke when you start up, as long as you are not taking any oil. 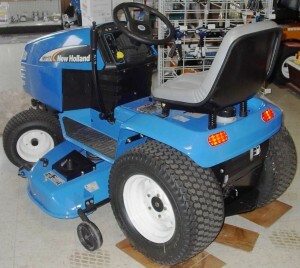 Q: I am working with a New Holland garden tractor. It has new plugs, filters, and fuel at the engine. The 24 horsepower Kohler Model CH22S engine runs O.K. for about 30 minutes until it’s warm then spits, sputters, backfires, and flames out the exhaust, all of which results in a great loss of power. Then after cooling down, it acts the same way again. A: Starting with the basics, do you have 5-30 oil in it? This engine has hydraulic valve lifters and they can pump up and hold the valve part way open causing a back fire. Another possibility is you might have a loose valve seat in one of the heads. It could also be a bad hydraulic valve lifter. Q: I have a 214 John Deere lawn tractor. I put all my snow removal attachments on and everything was working fine. I parked it, came home a week later, and it wouldn’t start. I can start it if I cross over the solenoid. I’ve checked all the wires and everything seems to be fine. So what do I do next? A: Check the wiring to your PTO safety switch or check the switch. Check the wiring to your shift lever safety switch and also the switch itself. Check the wiring condition plugging into your ignition switch or maybe it could be a bad ignition switch. If none of this takes care of it give me a call.